FILE - In this photo released by the Afghan Presidential Palace, Afghan President Ashraf Ghani, center, speaks to U.S. peace envoy Zalmay Khalilzad, third left, at the presidential palace in Kabul, Afghanistan, Jan. 28, 2019. The Taliban says it hopes ongoing negotiations with the United States would bring a long-demanded formal recognition for the insurgent group's "political office" in Qatar, insisting it would help accelerate consultations over the endgame in the Afghan war. U.S. special representative for Afghanistan reconciliation, Zalmay Khalilzad, and his team in recent months have held several meetings with Taliban envoys mostly in Doha. The two sides are set to meet there again on Feb. 25 to build on "significant progress" they made in six days of marathon talks in January. 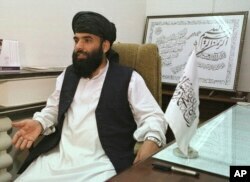 Suhail Shaheen, the spokesman for the Taliban's political office, in an interview told VOA that all their meetings with U.S. interlocutors and other foreign delegations take place in different hotels, making it difficult for his group to timely share details or progress with media. FILE - Suhail Shaheen, then-deputy ambassador of the Islamic Republic of Afghanistan, gives an interview in Islamabad, Pakistan, Nov. 14, 2001. "We have raised this issue the U.S. delegation," he said. Shaheen noted that the Taliban last week held its first formal "intra-Afghan" dialogue in Moscow with a large group of prominent opposition leaders from Afghanistan, and a follow-up meeting of those consultations is scheduled for next month in Doha. "The delegation from Afghanistan, of course, would come to the office (if it is recognized) and we will have a meeting with them and exchange views about the current peace process and how the Afghan issue can be resolved," he observed. No government envoys attended the Moscow meeting because the Taliban refuses to talk to Afghan officials, declaring the Kabul administration an illegal entity or American "puppets." The rigid insurgent stance has also forced the U.S. to exclude President Ashraf Ghani from the dialogue process. 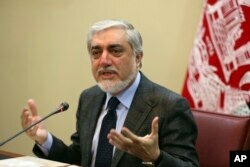 On Monday, Afghan Chief Executive Abdullah Abdullah, while addressing a weekly meeting of cabinet ministers, blamed "stubbornness of the Taliban" for being the main and only reason behind the war. He criticized the insurgent group for indulging in "propaganda" instead of joining "real talks" with the government. He did not elaborate. FILE - Afghan Chief Executive Abdullah Abdullah speaks during a press conference in Kabul, Afghanistan, Feb. 4, 2019. Abdullah's remarks came a day after President Ghani made an offer to the Taliban to open an office in Afghanistan for conducting talks with his government. Shaheen dismissed the offer and criticism as an attempt to "harm and derail" the current peace process. "Afghanistan is our own country and we don't need permission from anyone to open an office there. By making such offers at this stage, they [Ghani government] are trying to harm the peace efforts," Shaheen said. Khalilzad, while delivering a public talk in Washington last week, said that after many conversations, the U.S. has reached "an agreement in principle" with the Taliban on a framework that would provide guarantees that no terrorist group or individuals would be able to use Afghan soil for attacks against the U.S. and its allies. "Similarly, we have agreed in principle on a framework for possible U.S. [troop] withdrawal as part of a package deal," he noted. Taliban spokesman Shaheen said that both sides also agreed to appoint two working groups to flesh out these undertakings and bring them to the table for the meeting scheduled for this month in Doha. He anticipated further progress in the upcoming round of talks and vowed to again raise with U.S. delegates the issue of granting formal recognition to the Taliban's office, because his group is determined to carry forward Afghan peace talks in Doha. There was no U.S. response available to the Taliban's demand.